Sony Placement Papers PDF Download 2017-2018 | Aptitude, Reasoning & Verbal Ability Model Papers. Aspirants searching for Sony Placement Papers are at right place. The written exam conducted by Sony for selection is moderate to difficult. The exam has around 50 questions from Aptitude, Reasoning & Verbal Ability with a time allotment of around 60 minutes in total. Here we have provided the Sony Placement Papers for our readers to download and some sample questions gathered from various previous placement papers of Sony. Read the complete article and get an idea about the Sony Test Pattern. The sample questions discussed below have been structured carefully so that it is comparable to the actual placement test of the Sony. The type of questions featured in them & their level of difficulty can be comparable to the actual selection tests aspirants will face in the selection process of Sony. 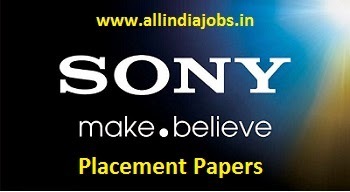 All India Jobs also provides candidates with free Placement Papers PDF of Sony company to download. Candidates can download the Sony Placement Papers PDF from the link provided below and practice the Sony Placement Test question even in offline. By practicing regularly aspirants can easily secure good scores in Sony Recruitment Drive. We have gathered some sample questions from various Sony Placement Papers and discussed them below with answers and solutions. Practice them well and all the best for Sony Recruitment Test. In this category, we have provided few questions from Sony Aptitude Test Placement Papers on topics like algebra, time & work, time, speed & distance, arithmetic, percentages, profit & loss, geometry etc. The pattern is -1, -2, …… Therefore, Missing number = 17 – 3 = 14. 8. The following questions consist of three words two of which have a certain relationship to each other, followed by four words. Select the word that has the same relationship as the original pair of words. Errata : Books :: Flaws : ? 9. Grain: Stock:: Stick : ? Second is collection of the first. 10. Appraiser : Building :: Critic : ? First comments on the second. 11. Read the following information and answer the questions (11-15) given below it. There are five friends Sachin, Kunal, Mohit, Anuj and Rohan. Sachin ia shorter than Kunal but taller than Rohan. Mohit is tallest. Anuj is a little shorter than Kunal and little taller than Sachin. Who is the shortest? Let us denote the five boys by the first letter of their names,namely S, K, M, A and R. Then , R < S < K < M and S < A < K. R < S < A < K < M Rohan is shortest. 12. If they stand in the order of their heights, who will be in the middle? R < S < A < K < M Anuj is in the middle. 13. If they stand in the order of increasing heights, who will be the second? R < S < A < K < M. In the order of increasing heights i,e shortest to tallest, Sachin is second. 14. Who is taller than Anuj but shorter than Mohit? R < S < A < K < M. Kunal is taller than Anuj but shorter than Mohit. 15. Who is the second tallest? R < S < A < K < M Kunal is second tallest. 16. Read the following information and answer the questions (16-20) given below it: (1)Seven students P, Q, R, S, T, U and v take a series of tests. (2)No two students get similar marks. (3)V always scores more than P. (4)P always scores more than Q. (5)Each time either R scores the highest and t gets the least or alternatively S scores the highest and U or Q scores the least. If S is ranked sixth and Q is ranked fifth, which of the following can be true? In terms of scores we have : V > P, P > Q i,e V > P > Q. If R scores the highest, we have R > ———- > T. If S scores the highest, we have S > ———– > Q or S > ———- > U. If S is ranked sixth and Q is ranked fifth, we have _ > _ > _ > _ > Q > S > _ In this case, R will rank the highest and thus T will rank the least. we have R > _ > _ > _ > Q > S > T Also, the order V > P > Q will be maintained i,e V and P will have second,third or fourth places. R > _ > _ > _ > Q > S > T. Again, if R ranks most, T ranks Lowest and occupies seventh place. Since V always ranks above P and Q so in the maximum, P and Q will occupy fifth and sixth places. Thus, V will not rank lower than fourth. 19. If S is ranked second, which of the following can be true? If S ranks second, R ranks first and T ranks lowest.The order V > P > Q will be followed. So, the arrangement will be R > S > _ > _ > _ > _ > T.
20. If V is ranked fifth, which of the following must be true? If V ranks fifth, P and Q coming before it will occupy sixth and seventh places respectively i,e Q ranks least. So, S will score the highest. 21. Showing the man receiving the prize, Saroj said, “He is the brother of my uncle’s daughter.” Who is the man to Saroj ? Brother of uncle’s daughter—Uncle’s son – Cousin. So, the man is Seema’s cousin. 22. Pointing to a man, a woman said, “His mother is the only daughter of my mother.” How is the woman related to the man? Only daughter of my mother – Myself. So, the woman is man’s mother. 23. Pointing to a photograph, a person tells his friend, “She is the granddaughter of the elder brother of my father.” How is the girl in the photograph related to his man? 24. If in a certain language FASHION is coded as FOIHSAN, how is PROBLEM coded in that code? The first and last letters of the word remain as such and the remaining letters are written in a reverse order to obtain the code. 25. If in a certain language KINDLE is coded as ELDNIK, how is EXOTIC coded in that code? The letters of the word are written in a reverse order to obtain the code. 26. If VICTORY is coded as YLFWRUB, how can SUCCESS be coded? Each letter of the word is moved three steps forward to obtain the code. 27. (Directions: 27-30). Each question given has a problem and two statements numbered 1 and 2 giving certain information. You have to decide if the information given in the statements is sufficient for answering the problem. Indicate your answer as A. statement 1 alone is sufficient, but statement 2 alone is not sufficient to answer the question B. statement 2 alone is sufficient, but statement 1 alone is not sufficient to answer the question C. both statements taken together are sufficient to answer the question, but neither statement alone is sufficient D. each statement alone is sufficient E. statements 1 and 2 together are not sufficient, and additional data is needed to answer the question How many ewes (female sheep) in a flock of 50 sheep are black? 1. There are 10 rams (male sheep) in the flock. 2. Forty percent of the animals are black. From (1) we know the ratio of male to female sheep, but nothing about the color distribution. So the answer cannot be A or D. From (2) we know that forty percent of the animals are black but nothing about whether they are male of female. So the answer cannot be B. Even putting the information together does not help because there is no way to tell what fraction of the female sheep re black. 28. Is the length of a side of equilateral triangle E less than the length of a side of square F? 1. The perimeter of E and the perimeter of F are equal. 2.The ratio of the height of triangle E to the diagonal of square F is 2v3 : 3v2. From (1) we can tell that a side of E is longer than a side of F, since 3 x side E = 4 x side F. Hence (1) is sufficient to answer the question and the answer must be either A or D. From (2) we could work out the ratio of the lengths of the sides (there is no need to do this, but since we are dealing with regular plane figures the geometry is quite simple), and although we cannot get the actual lengths, we can see from the ratio whether one is bigger than the other. Statement (1) tells us nothing about b and so the answer cannot be A or D. To find what percent a is of b we need to solve the expression (a/b) x 100. Statement (2) allows us to do just that: (a/b) = 1/20. 30. A wheel of radius 2 meters is turning at a constant speed. How many revolutions does it make in time T? 1. T = 20 minutes. 2. The speed at which a point on the circumference of the wheel is moving is 3 meters per minute. To find the number of revolutions we need to know the rate of turning and the time duration. Statement (1) gives us only the time, and so the answer cannot be A or D. Statement (2) tells us the rate at which a point on the circumference is moving, which, since we know the dimensions of the wheel, is sufficient to determine the number of rotations per minute. But since we do not know the time, B cannot be correct. But putting (1) and (2) together we have all we need, so the answer is C.
Reasoning Questions that show a similar pattern with the ones on Sony Reasoning Test can be attempted here. We provide a large question bank of all the Sony Reasoning Test Sample Papers. 1. In a certain code language, ‘+’ means ‘/’, ‘/’ means ‘*’, ‘*’ means ‘-‘, ‘-‘ means ‘+’. ‘+’ means ‘/’, ‘/’ means ‘*’, ‘*’ means ‘-‘, ‘-‘ means ‘+’. (32)2 = 1024 is the next number. 3. (A) The problem of child labour has reached epidemic proportions in India with the number of child labourers increasing from 12 million to over 40 million child workers. (B) India has the worlds largest number of child labourers. The increase in child labour lead to India becoming the country with largest number of child labourers. This is the final arrangement and step VI is the last step for this input. Which of the following will be the third step for the following input? Step I: The smallest number becomes first and the remaining numbers shift one position rightward. Step II: The largest number among given numbers becomes last and the remaining numbers shift one position leftward. The steps are repeated alternately till all the numbers get arranged in ascending order and that will be that last step for that particular input. 5. Should children be allowed to use internet in internet kiosks. I. Yes, all the internet kiosks are using filter-software’s, which do not allow adult software to be downloaded. II. No, internet is a communication medium, which transmits information and does not distinguish between a child and a grown-up. One important reason to stop children from using kiosks is audit material available on the net. Hence, statement I is a strong argument. Statement II gives an irrelevant reason as its argument and is very weak. 7. Read the above passage, answer the below question. Which of the statements A, B, C, D, and E mentioned above would represent an assumption implicit in the given paragraph or an inference which can be drawn from it? does not indicate the exact distance from LOC at which these roads are being laid, but from the fact that objections of the Indian government it can be understood that it is in violation of the bilateral agreement. Hence, (E) can be inferred. 8. If it is possible to make a meaningful word using the sixth, seventh, ninth and tenth letters only once of the word “FUNDAMENTAL”, what will be the first letter of the word? If no word can be formed, mark the answer as X, If two words can be formed, mark the answer as Y. If more than two words can be formed, mark the answer as Z. The words that can be formed from the letters are TEAM, TAME, MATE and MEAT. 9. If it is possible to make a meaningful word from the third, sixth, eight and eleventh letters of the word ‘DISTINGUISH’ using each letter only once, first letter of the word would be your answer. If more than one such word can be formed, your answer would be ‘M’ and if no such word can be formed, answer is ‘X’. The 3rd, 6th, 8th and 11th letters are S, N, U and H respectively. The word that can be made is SHUN. The 1st and 3rd letter of the group are each moved to 1 step backward while the 2nd and 4th letters are each moved one step forward to the corresponding letters the second group. Missing number = 72 * 5 = 360. A. public health campaigns that raise consciousness and propose lifestyle changes are a productive way to fight obesity. B. obesity is the leading cause of diabetes in our country. C. people in our country watch too much television and do not exercise enough. D. a decline in obesity would radically decrease the incidence of asthma. E. fast-food restaurants and unhealthy school lunches contribute greatly to obesity. The support for this choice is in the last sentence, which states that major public health campaigns that increase awareness and propose lifestyle changes are important in our fight against obesity. Choice b can be ruled out because although the paragraph states that obesity can lead to diabetes, it doesn’t tell us that it is the leading cause of this disease. Choices c and e might sound reasonable and true, but they are not supported in the paragraph. And although we are told that obesity has been connected to asthma, this fact is not quantified in any way, so choice d is also not supported by the information given. Should India support all the international policies of United States of America? I. No, many other powerful countries do not support the same. II. Yes, this is the only way to gain access to USA developmental funds. Argument I is not strong because India should take its stand according to its need. Argument II is not correct because of the word ‘only’. Hence, argument II is not strong. 14. Here are some words translated from an artificial language. Which word could mean “playing”? According to this language, slar means jump. The suffix –ing is represented by –y. Since choice b is the only one that ends in the letter y, this is the only possible option. All other parts are of the tree. In this section, we have discussed some sample questions from Sony English Test Model Papers. Contenders can practice these questions and get an idea about the questions asked in Sony English Placement Test. 1. The robbers ————————- by the police. 2. One who cuts precious stones. The word vivacious (animated, cheerful) and languid (sluggish) are antonyms. 4. Patrice was a(n) ______ girl when she was teenager—long-limbed and constantly tripping over her own feet. Ungainly (adj.) means clumsy or awkward. 5. He holds a very important position. He is not well paid. (A) Although he holds a very important position …..
(B) Unless he holds a very important …..
(C) Inspite of the fact that he holds a ….. He deserves to be well-paid, though he is not. Hence, conjunctions like but, though, although, in spite of the fact that, etc. can be used to effectively put forth the idea while combining the two sentences. 6. I do not agree ——— you on this point. Affidavit refers to a written statement for use as evidence in court, sworn on oath to be true. The word affirmation also means the same. 9. She went ahead with dogged determination, _____by the adversities which came her way and ultimately emerged successful. She emerged successful in spite of the ‘adversities’ because she was conrageous or ‘undaunted’ or ‘unintimidated’. 12. You must have a through understanding of the subject. Only then you will be able to answer any question pertaining to it. (A) Although you have …..
(C) Unless you have …..
Only ‘C’ which presents a condition is correct. A and B denote a contradiction. 15. You would not drive so fast; we have plenty of time. The sentence suggests that driving fast is not necessary. Hence the most appropriate modal verb to suit this context would be ‘need not’. ‘Will not’ suggests simple future which is inapt. ‘Had not’ and ‘do not’ are illogical. Hope the syllabus and Sony placement papers provided here are helpful for aspirants while preparing for Sony Placement Test. Sometimes Sony company may change their syllabus and exam pattern. So Please check this article periodically for the latest syllabus.